"This is Burma. It’s quite unlike any other place you know about." the British writer Rudyard Kipling couldn’t be more accurate in describing Myanmar (formerly Burma). Truly this is a country that hasn't been as changed by globalization as a lot of more popular destinations. For many travelers, it is a mysterious place of unspoiled treasures. And, of course, the best way to feel its charm is to experience it yourself. From exploring the ancient temples to meeting the warm, engaging people, it’s going to be eye-opening and heart-warming. Take a look at these top 10 experiences that you would most like to have in Myanmar and let them inspire you on your next adventure! Yangon’s impressive 2,500-year old golden Shwedagon Pagoda is the most visited and sacred Buddhist temple in Myanmar. Along with a temple complex around it, it is visible from almost anywhere in Yangon. A stream of pilgrims from around the world comes to admire its magnificence every day. It’s also a nice gathering place where local people worship, wash statues, and mediate. The best time to visit Shwedagon Pagoda is just before sunset when local residents paying their respects after finishing work or school. It's the perfect time to photograph Shwedagon Pagoda and mingle with the locals. Bring snacks and water, and wear temple-appropriate clothes that cover your knees and shoulders. The sprawling temple complex of Bagan is the main reason why many travelers, including me, come to Myanmar. There are more than 2,000 pagodas and temples built by the kings of Bagan between the 11th and 13th centuries. 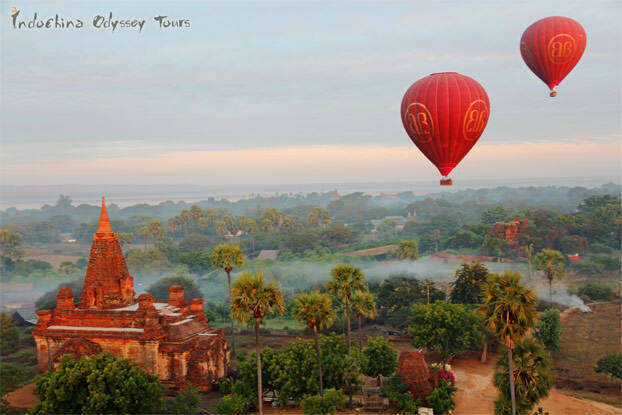 The best way to experience Bagan is a hot air balloon ride at sunrise/sunset. For some famous temples like Shwesandaw Paya, Buledi, Ananda Pahto, Dhammayangyi Pahto, and Thatbyinnyu, it’s worth exploring the insides as well. The Balloon over Bagan service operates twice daily, early in the morning just before sunset and late in the evening just before sunset from October through March. A whole balloon ride lasts about 1 hour. My favorite sight in Myanmar- the U Bein Teak Bridge at Amarapura (itself a former capital of Burma), which is just 11 kilometers south of Mandalay. 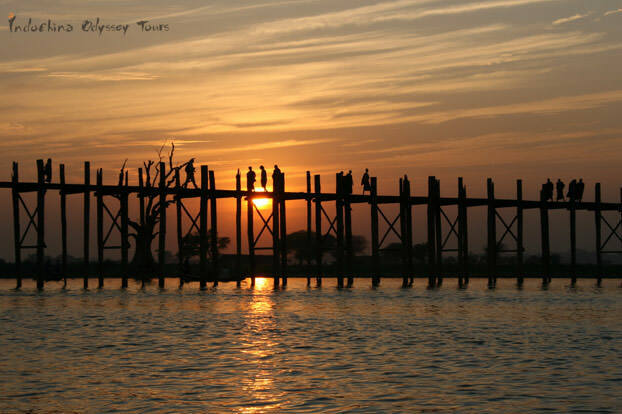 Nothing could be quite as magical as sunset view at the longest and oldest wooden teak bridge in the world. The teak wood was once part of the Royal Palace in Mandalay but was turned into a bridge by the mayor, U Bein. The columns were no longer needed so they found a new home for them, helping the common people across Taungthaman Lake. At 1.2 kilometers long, the U Bein Bridge is one of Burma's most photographed sights. Most tourists come at sunset for the orange glow which gradually engulfs the bridge and silhouettes the columns upon it. The best way to photograph the iconic silhouettes is from a hired boat on Taungthaman Lake. During the dry season (November to April) the lake is quite shallow, it’s easy to classic silhouette shot; during other times, much of the bridge is under water, but be rest assured, there are plenty more classic images to capture. The leg-rowing Intha people, the wooden stilt houses on water and the floating gardens are what make the Inle Lake so different and enchanting. This vast picturesque lake, 900 meters above sea-level, is home to Intha people who live and work on water. The Intha people go about their business on small wooden boats, row along the channels that separate their floating gardens with one leg around a long oar and the other foot firmly gripping the flat stern of the boat. 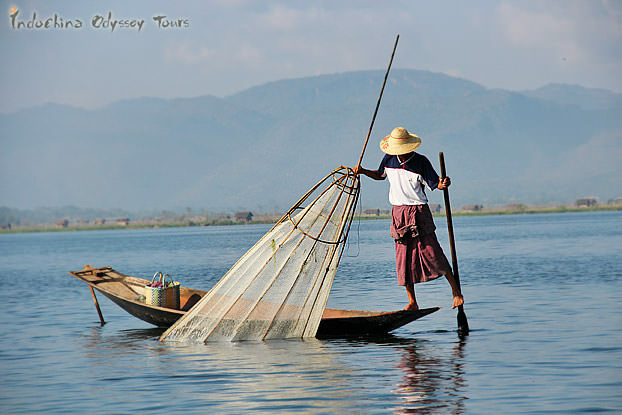 A boat trip through Inle Lake gives you an interesting peek into life in traditional Myanmar. If you visit Inle Lake in September or October, you may have the chance to witness the grandest event taking place in the region - the Phaung Daw Oo Pagoda Festival. To get into Inle Lake, the easiest way is taking a domestic flight to Heho, which is about one hour's a car-ride from the lake itself. If you want to take a bus or train, you need to go via the nearby Shwenyaung Junction, from where it is a 20 minute taxi ride to the town of Nyaung Shwe near Inle Lake (for those who travel with Odyssey, there is no need to worry about this as we will arrange private car for you). A wide range of accommodations can be found in Nyaung Shwe. Myanmar is not known as a beach destination like its neighbors, but it does have some of the finest stretches of beach that remain undiscovered by tourists and unspoiled by development. The most beautiful one is the Ngapali Beach, which is just a 45-minute flight from Yangon. With miles of sparkling sands, swaying green palms and turquoise waters, the Ngapali Beach is a nice place for you to relax as well as experience the true pulse of Myanmar. Here small boats head out every day to catch seafood that is later served up in restaurants. Ox carts wander along the beaches. And a dozen bungalow-style resorts provide space for you to spend a few pampered nights. The peak season of Ngapali is from November to March. In the rainy season (mid-May to mid-September), most hotels are closed. The fabled Kyaiktiyo Pagoda on a huge gilded boulder is the third most important Buddhist pilgrimage site in Myanmar after the Shwedagon Pagoda and the Mahamuni Pagoda. The Gold Rock seems to defy gravity as it appears to be precariously perched on the edge of a hill over 1100 meters above sea-level, 160 km from Yangon. It is not clear as to how this spectacle has balanced on this cliff over the ages. Legend has it that it’s secured by a strand of the Buddha’s hair. Men are allowed to walk on a bridge spanning a chasm to the boulder to affix gold leaf squares on the rock’s surface and feel its magic. But women can only pray 5 meters far from Golden rock. Kyaiktiyo Pagoda is located near Kyaikhto town, 210 kilometers east of Yangon. 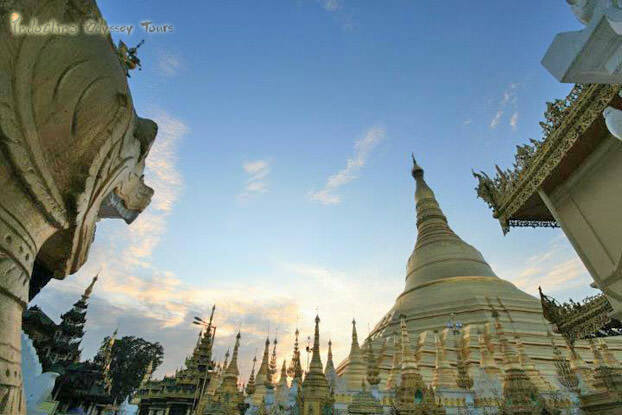 You can visit it on a day trip from Yangon. To get to the pagoda, take a pick-up truck at the base town and then hike to the top or choose to get carried up on a large palanquin carried by 4 men. It’s always better to take just hand luggage to avoid hassles. For those who want to stay overnight on the mountaintop and see the sunrise, there are some hotels on the top, although most are pricy. I recommend taking a local boat out along the vast Ayeyarwady River as it’s a rare opportunity to discover Burma from a different angle - on water. It is the lifeblood of Burma and one of the World’s Best 15 Rivers for Travelers selected by CNN. As you cruise the river, golden temple spires, tiny villages, emerald rice paddies, bustling markets all come into view. The real life of Burmese people is unfolded just before your eyes. A typical Irrawaddy River runs between Bagan and Mandalay with accommodation overnight on the boat and sightseeing in Bagan and Mandalay. So it’s not only a chance to catch a glimpse into the real life along the river but also a nice way to get around the two places. 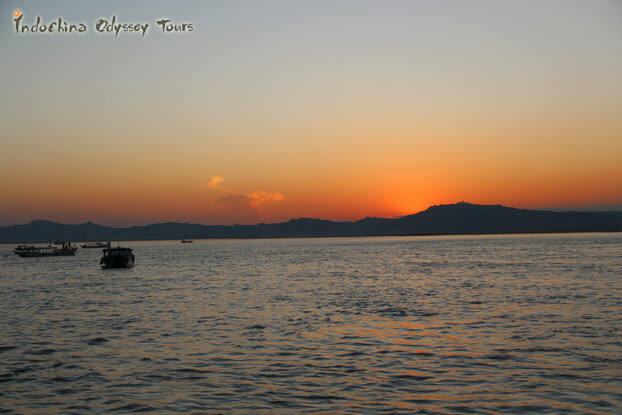 There are also many chances to take a short ferry ride across Irrawaddy River and discover life along it. Close to Bagan in central Myanmar, Mount Popa is well known as a pilgrimage site, with numerous Nat (spirits) temples and relic sites atop it. The mountain itself is an extinct volcano rising over 1,500 meters above sea level, 60km (about 30 mins’ car ride) away from Bagan. To reach the mountaintop, you need to climb barefoot up 770 steps and often find monkeys en route. But it is well worth the effort to see the temples at the top and the stunning views of the surrounding area. 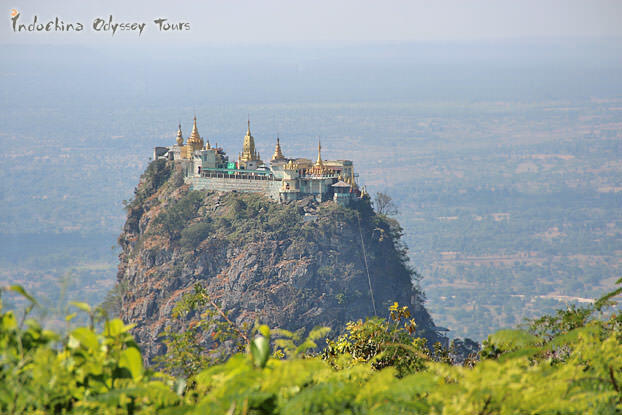 Mount Popa is usually visited on a day trip from Bagan, as a great way to take a break from the endless temples. 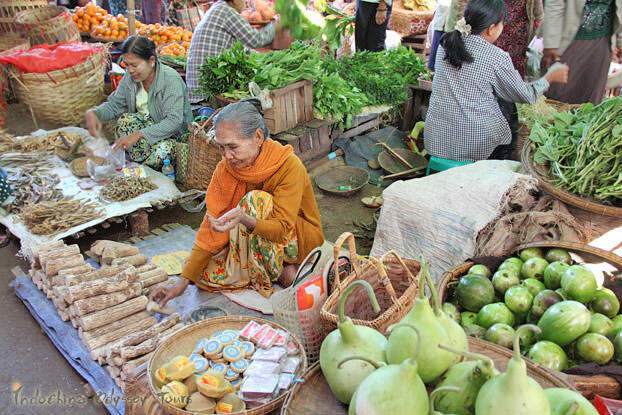 Visiting the markets of Myanmar can be fun, educational and a chance to mingle with the locals and buy souvenirs. Whether you are shopping for gems in Yangon’s Scott Market, embroidered tapestries in Mandalay, or intricate lacquerware in Bagan, there is no better way to immerse yourself in the local way of life than to soak up the atmosphere of a local market. Take a look at our Myanmar shopping tips. I’ve been writing about a lot of the sights you can see in Myanmar but one of the best experiences you can have in Myanmar is simply doing what locals do. So, chew some betel nut (and you will see lots of folk with red teeth! ), drink a glass of sugarcane juice that can be easily found , wear a longyi (for men) or htamein (for women) and paint your face with Thanaka (traditional sunscreen), you are so close to Myanmar! What’s more encouraging, local people seem to love showing you how things are done. Thanaka, it's just the local form of sunscreen. 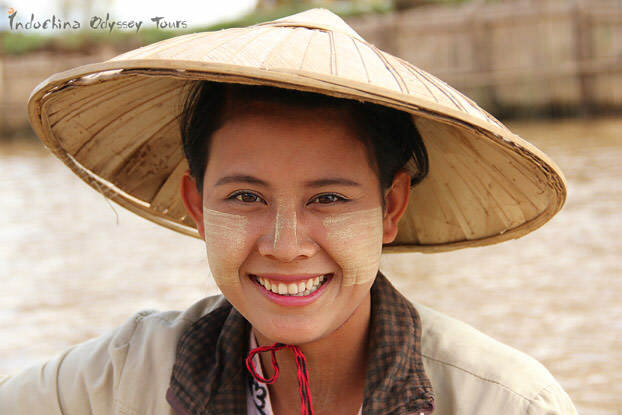 Check out our sample Myanmar tour itineraries here to experience all that Myanmar has to offer. As always, feel free to like or share my post on social media.  You can also write to ; if there are any questions about traveling in Myanmar. Travelling to Southeast Asia in monsoon season (June-October) may not sound like an appealing idea at first thought. But here we want to tell you that a trip to Southeast Asia during monsoon is actually worth doing. Here is why. With over 2000 ancient temples and pagodas, Bagan has the history and beauty that rivals sites like Angkor Wat. Cycling, sunsets watching, hot air balloon rides….there are ways to enhance your visit to Bagan and bring it beyond the typical day tour.